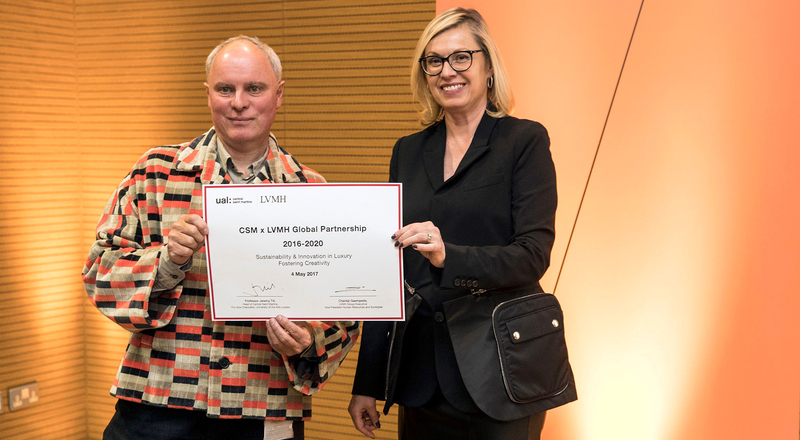 On May 4, 2017 LVMH and Central Saint Martins announced a groundbreaking new partnership to promote creativity and identify cutting-edge solutions to drive sustainability and innovation in luxury. Under the banner LVMH & Central Saint Martins “Sustainability & Innovation in Luxury | Fostering Creativity”, this new program is inspired by a shared desire to address the many challenges facing the luxury industry. After many years of academic and creative collaboration, LVMH is taking its relationship with Central Saint Martins to a new level in 2017, creating a new program with the renowned art and design school. The partnership will promote creativity, nurture young talents and identify disruptive solutions to address sustainable development and innovation in luxury. “We are very pleased to launch today such an inspiring program on sustainable innovation in luxury, fueled by our numerous and successful past collaborations and creative projects with Central Saint Martins,” said Chantal Gaemperle, Group Executive Vice President Human Resources and Synergies. 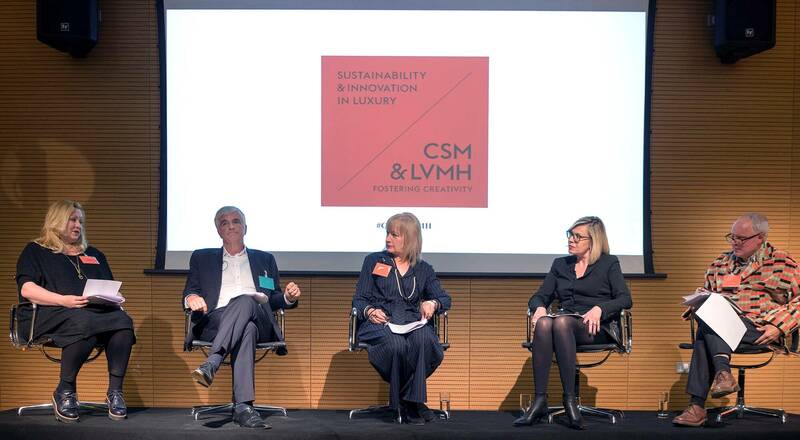 The inauguration of the LVMH & Central Saint Martins “Sustainability & Innovation in Luxury | Fostering Creativity” program on May 4th was marked by a full agenda of events at the London campus focused on students and their careers. Throughout the day students had a chance to learn more about LVMH and meet creative, business and human resources teams from 14 Maisons (Louis Vuitton, Christian Dior Couture, J.W Anderson, Céline, Emilio Pucci, Givenchy, Kenzo, Loewe, Loro Piana, Nicholas Kirkwood, Glenmorangie, Bulgari, Chaumet and Sephora). They discovered career opportunities and presented their portfolios. In addition to interviews for internships or job offers they attended workshops to give them a better understanding of the diverse universes at LVMH and its Maisons. These meetings were followed by the introduction of Carole Collet, the new CSM LVMH Director of Sustainable Innovation, who will lead the collaboration between LVMH and CSM, developing a curriculum to embed sustainable innovation across disciplines and create ambitious projects with LVMH Maisons. – Recruitment and campus events.